Byline A Game of Intrigue During The Ascendancy of Ancient Rome. 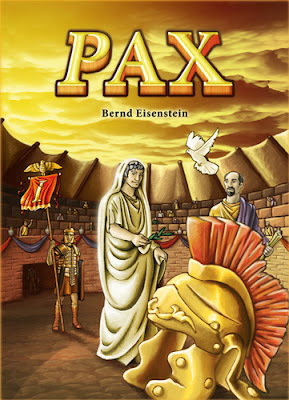 In Pax players are the enemies of Rome. Their goal is to gain more power than Rome in as many of seven categories as possible. The seven categories of influence cards are: Land, Intrigue, Religion, Senator, Wealth, Fleet, and Army. Each category yields either abilities or points for accumulating them. Additionally, Rome will be accumulating cards in all categories. The game starts with Rome receiving three influence cards face-down. An influence card will then be placed face-up in front of each of the legions located in the center of the table. The number of legions is represented by one more than the number of players. Each player starts with five aurei coins and one influence card. On a player’s turn they will draw 3 cards: one must go into their hand, one must be placed at one of the legions, and one must be returned to the bottom of the draw deck. Things get interesting with the drawing of cards because the player must decide what to do with card 1 before drawing card 2 and likewise, must place card 2 before drawing card 3. After the draw phase the active player can buy a set of cards from the legions and play cards from their hands on the table in front of them. Buying cards and playing down cards both cost money. The player would then collect income from the bank based on the cards played to the table in front of them. Play continues around the table until each player has taken one turn drawing cards and taking buy/play actions. At the end of each round the most valuable set of cards remaining in front of the legions are given to Rome. Play continues in this manner until the draw deck is exhausted at which time scoring takes place. Players compare their scores against the scores of Rome adding in the three face-down cards Rome received at the start of the game. If Rome wins or ties in four of the seven categories the player with the most points in the Intrigue category is declared the winner. If the players have a higher score than Rome in at least four of the seven categories then the player with the highest score wins. Pax is a game where players have to be aware of the other players strategy. One’s strategy may be try to win with lots of Intrigue points while helping Rome to victory instead of working to defeat Rome. Pax also plays well as a solitaire game.